The Bulldog Investment Fund is a student-managed fund in the Brock School of Business. With investment trade decisions in the students’ hands, this is a unique learning experience. Launched in 2008, The Bulldog Investment Fund is a student-managed fund, taught as a course in the Brock School of Business at Samford University. This course teaches students how to take and defend a position. Student managers must be able to give a succinct thesis for purchasing a stock and be prepared to answer nearly any question other student managers will rightfully ask. With final, binding decisions for investments and trades resting in the hands of students — the hallmark of student ownership — this is truly a unique learning experience. Students (undergraduate and graduate) are accepted by application and interview to have the opportunity to learn the science and art of investment management. The resulting team confronts real market issues, discovers and analyzes real stocks, and invests real dollars. As fund managers, they make regular presentations to the members of the Investment Committee of the Samford University Board of Trustees. Shortly after the inception of the Fund, the Board was so impressed with its ranking — among the nation’s top three percent of student-managed funds — that Samford’s Trustees voted to increase the investment pool to more than $1 million. The Fund is now worth upwards of $2 million. The Bulldog Investment Fund is an educational enterprise for its managers. Nothing herein constitutes investment advice. In 2007, an anonymous donor pledged $100,000 for the purchase of four financial displays, including LED tracker, streaming NYSE ticker display, and two LCD panels, which turned an existing computer lab with instructor station and 34 student work stations into a center for live financial information and stock feeds. Students have access to professional-grade software and subscription services including Bloomberg terminals. The Fund uses a custom-built, limited-access SharePoint website to store and retrieve investment proposals, meeting minutes, investment sites' addresses, training materials and organizational documents. Each semester, the Bulldog Fund managers takes part in a community outreach project that enables Fund Managers to teach others about investments and the world of finance. Throughout the course, investment professionals frequently speak to student managers providing a real-life outlook on the economy and other aspects of investing. Student managers have had the opportunity to attend local and national conferences presented by top economic strategists and investment professionals. Fund Managers have participated in the CFA Society of Alabama's Investment Research Challenge. The Challenge is a competition in which student teams from the top area business schools write an equity research report on an assigned company and present their findings to a panel of investment industry experts. The winning team advances to compete in the Americas Regional Investment Research Challenge hosted by CFA Institute. This annual educational initiative, based on the Investment Research Challenge originally developed by the New York Society of Security Analysts, is designed to promote best practices in research among the next generation of analysts through hands-on mentoring and intensive training in company analysis. It complements students' university curriculum by simulating the 'real world' experience of an equity analyst. The Challenge spans one semester, and consists of an analysis of a public company, mentoring by a professional research analyst or portfolio manager, writing an equity research report, and presentation of research to a panel of experts. The winners of the Alabama local competition advance to compete against local winners from North and South America. Created in the Spring semester of 2008, the Fund consists of one faculty advisor, one co-facilitator and a group of students (collectively, the "Fund Managers"), who may be undergraduate or graduate students. Admission to the Fund's companion course is determined by application and approval of the faculty advisor. 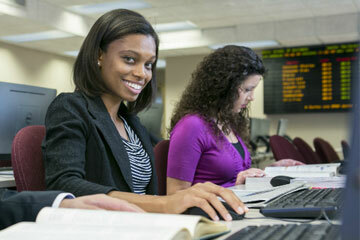 The course requirements and prerequisites are established by the Brock School of Business faculty. The companion course may be taken twice for course credit. The investment goal of the Fund is to maximize the long-term rate of return consistent with prudent risk limits. The Fund's objectives are: to deliver experiential education in securities analysis and portfolio management and to generate an investment return (capital gains and income) that consistently exceeds the benchmark's total return. Alumni of the Bulldog Investment Fund have gone on to careers as revenue analysts, development directors, and sales representatives with companies ranging from the American Cancer Society, to BBVA Compass Bank, to the United States Armed Services. Birmingham Business Journal featured Bulldog Investment Fund in Wealth Management Section.